This 1995-6 book is an apologetic for the church, not based upon scriptural argument, but based upon experiential argument, i.e. based on worldly attacks upon the church which have failed throughout the ages and continue to fail today. Kennedy correlates the strength of the church to church growth. As evidence of the vitality of the church proving the veracity of the church, Kennedy predicts that there will be a billion professing Christians by the turn of the century. And by the middle of the next century, evangelical megachurches, with hundreds of thousands of members in each church, will be the norm. Also, he predicts, national leaders who do not proscribe a high moral and ethical lifestyle will never be elected to high office. Once one gets past Kennedy’s rather fanciful predictions in the early chapters (seemingly based upon either an amillennial or post-millennial eschatology) the book is quite interesting. 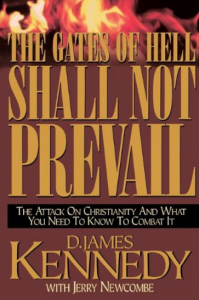 Kennedy provides numerous illustrations where Christianity gets bashed by the gays, the media, the entertainment industry, the liberal churches, etc. Some of the illustrations are becoming dated; many you have no doubt heard, others you may not have heard or read about. Part of Kennedy’s solution to the public attacks on the church is for Christians to become active in the “public square,” i.e. run for public office, become involved in public Christian organizations opposing church bashing such as the National Legal Foundation, etc. While it is not a deeply theological book with a tendency towards ecumenism at times, I recommend it for pastors as it will definitely help one stay abreast of the broad range of attacks upon the church while at the same time, provide lots of sermon illustrations. Overall, it is vintage Kennedy. I enjoyed the book and recommend it to others.